Get the Open in Sumner celebration started off right with a magical evening in the park. And no one does magic like Disney! After The Shy Boys concert, settle in to enjoy Disney’s celebration of golf with The Greatest Game Ever Played shown outdoors in Heritage Park. The 2015 Open is making history, being the first one held in the Pacific Northwest. 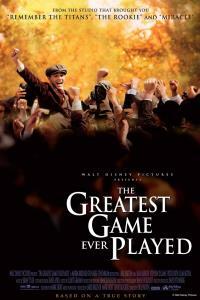 Fittingly, the movie tells the story of history being made over 100 years ago at the 1913 US Open, when 20-year-old Francis Ouimet played against his idol, the 1900 champion, Englishman Harry Vardon. Bring out the whole family for a special night in Sumner. Pucker Up! → ← Rhubarb Hummus?